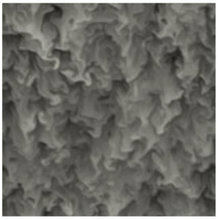 We study unconfined homogeneous turbulence with a destabilizing background density gradient in the Boussinesq approximation. Starting from initial isotropic turbulence, the buoyancy force induces a transient phase toward a self-similar regime accompanied by a rapid growth of kinetic energy and Reynolds number, along with the development of anisotropic structures in the flow in the direction of gravity. We model this with a two-point statistical approach using an axisymmetric eddy-damped quasi-normal Markovian (EDQNM) closure that includes buoyancy production. The model is able to match direct numerical simulations (DNS) in a parametric study showing the effect of initial Froude number and mixing intensity on the development of the flow. We further improve the model by including the stratification timescale in the characteristic relaxation time for triple correlations in the closure. It permits the computation of the long-term evolution of unstably stratified turbulence at high Reynolds number. This agrees with recent theoretical predictions concerning the self-similar dynamics and brings new insight into the spectral energy distribution and anisotropy of the flow.